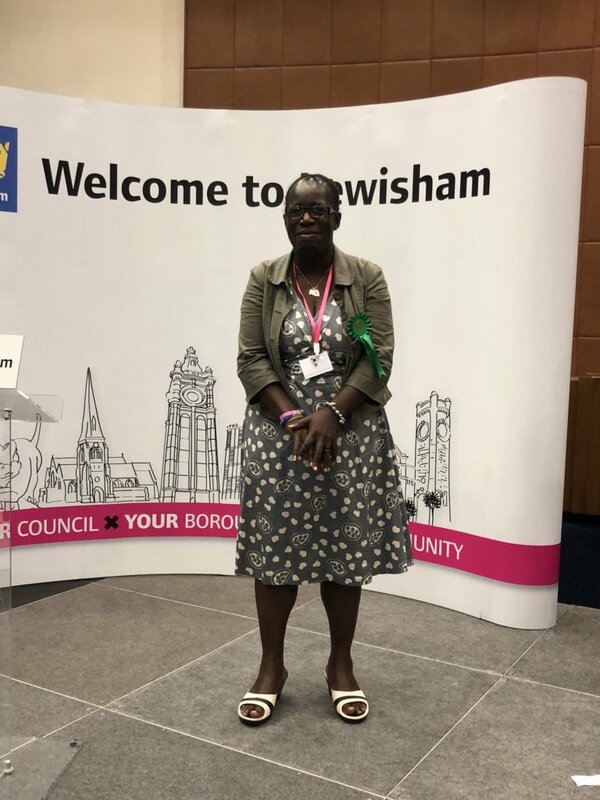 Rosamund Adoo-Kissi-Debrah is celebrating a doubling in her party's vote share in Lewisham East's by election, where she campaigned on a platform of cleaning the borough's toxic air and the future of young people. Despite Janet Daby's victory, there was a dramatic fall in her party's majority as voters appeared to turn away from Labour over their unclear stance on Brexit, to the benefit of the Greens. Both they and the Lib Dems - who leapfrogged the Conservatives to second place - are calling for a People's Vote on the final Brexit deal. "Thank you everyone in Lewisham East who went out and voted for me yesterday. I have been truly amazed by what I have achieved - doubling the Green Party's vote share on a night when the majority of parties lost votes. "I would like to send my congratulations to Janet Daby on becoming the first black woman MP in Lewisham. "Thank you to all the Green Party members and supporters who have supported in any way - from leafleting to social media. Thank you too to my friends who have supported me during the campaign and my children for their never ending love. "It truly was a privilege to stand for the Green Party. I knew they shared my passion to Clean up London's toxic air - I had been very impressed by the commitment of Green Assembly Member Caroline Russell when working with her on bringing the Ultra Low Emission Zone to Lewisham. "Although we didn't win we managed to double our share of the vote and this shows what is important to the people of Lewisham. On the doorstep people were concerned about local issues such as clean air, good secondary schools and mental health. But the majority of people were concerned most about the negative impact of Brexit and this was reflected reflected in the results last night. "Yesterday the new Home Secretary had to do a U turn on the Government's own immigration policy which I have been discussing with residents during the campaign and allow, doctors, nurses and skilled staff in. The EU has been instrumental in creating equality for women, protection from sexual discrimination, maternity leave all over europe and flexible working. I believe all these benefits will be put in jeopardy if we leave the EU. There are numerous other issues that have risen since the vote that were not on the ballot paper, the border in Northern Ireland, the people in Gibraltar that voted 96% to remain and the union of the the UK. For this reason I will be joining the March on June 23rd to show my support for a people's vote on the final deal." Adoo-Kissi-Debrah was visited during the campaign by Samir Jeraj, acting Chair of the Greens of Colour group. Co-Leader Jonathan Bartley this week visited the memorial in Lewisham Hospital to Rosamund's daughter Ella who died 5 years ago of a severe form of asthma, and in whose memory the Green candidate's Foundation which supports to hospital is named. Assembly Members Sian Berry and Caroline Russell also gave their support during the campaign, highlighting the "toothless" government air quality plans on a visit to the South Circular. Rosamund sent thanks to the Green politicians for their visits to support her and for "having such faith in me". The air quality campaigner also thanked "the trustees of my charity, including Adam Daly-Gourdialsing my manager, as well as my legal team. "I will continue working for the Ella Roberta Family Foundation which campaigns for Clean Air and raises awareness of the dangers of asthma. "As for my political future I will make a decision once I have discussed it with my children, the leaders of the Green Party and the Lewisham Green Party. Regardless, I would like to thank them again for this fantastic opportunity."